One evening during the summer of 2002, my husband, John, came home from a business meeting at the Experience Music Project in Seattle with a book in his hand and a smile on his face. The book was Tom Noe’s book on harp guitars. The reason for the smile was that the book’s cover showed a picture of a guitar similar to a guitar I was given by my mother. "Around 1895 or 1896 there was a boom in Port Townsend. The family moved to Port Townsend and rented a large house and Dad made a cabinet shop upstairs where he made violins and guitars. Dad made 200 instruments for a man named Knutson (sic) who played the violin. He sold them along the Coast. One violin, which was said to be like a Stradivarius, was sold in San Francisco, I believe for $200. Esther and Hannah helped Dad by jumping on the board which made the machines go round and round (of course they had no electric power or steam power in those days which could be used upstairs). Hannah had 2 guitars, Esther had one and Oscar had the little one I have, as after they moved to Green Lake, Dad made him a big guitar." Left to right: Otto, Hannah, Elise, Oscar and Esther. This photo was taken in South Bend, Washington. I am not sure of the exact date but the family lived in South Bend before moving to Port Townsend in 1895. They also probably visited South Bend on occasion as one of Otto's brothers who was married to one of Elise's sisters lived in South Bend. I remember seeing an old photograph in my Mother’s things that I was sure was of the same family as the picture shown in Tom’s book . 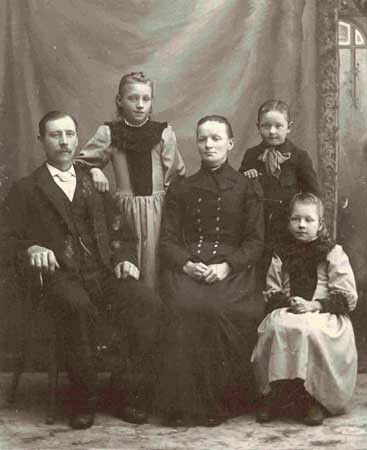 This family shown in the book was the Knutsen family. We searched through old pictures and found the picture which was taken in Port Townsend and simply labeled on the back, "Knutson." We then made contact with Tom Noe, who in turn had us email Gregg Miner. Thus opening the door to reveal this new information! Now to a little family history......My mother was Ellen Rebecca Anderson Duncan. 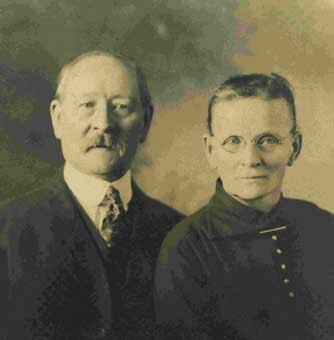 Her parents, Otto and Elise Anderson, immigrated to the United States from Sweden in 1888 and lived in several locations in the state of Washington, including Port Townsend, and finally settling in Seattle in 1897. According to mother’s notes, after leaving Port Townsend and returning to Seattle my grandparents lived for a period of time on the east side of Lake Union. (The Knutsen family lived near Lake Union when they moved to Seattle.) At this time, or at least for part of this time, my grandfather worked for Lytell Cabinet Shop, which was at Westlake and Mercer Streets. After having lost all his tools in the historic Seattle fire, in 1898 my grandfather moved the family to a new home which he built in Green Lake, Washington. Green Lake is now part of Seattle. He built a shop on the property and went into business as a cabinet maker making custom furniture, some of which we and other family members are still using. Grandpa Anderson also displayed an extension table which he had invented at the Alaska Yukon Pacific Exhibition (AYP) in 1909. Since Knutsen lived in various locations near the south end of Lake Union and spent time at the AYP, I think it is reasonable to believe that they had some association in Seattle as well as Port Townsend. We do not have any documentation of this. 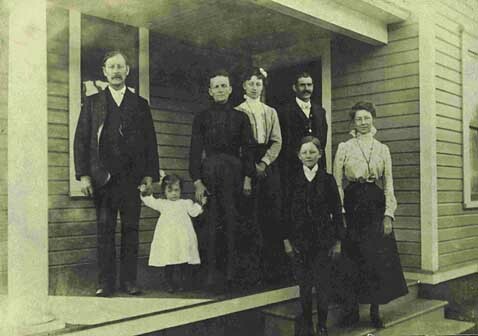 Left to right on the porch: Otto, Ellen (my mother), Elise, Hannah, Carl Hulten, Hannah's husband. On the step: Oscar, Esther. This photo was taken on the porch of the house that Otto built, or hand built, and moved into in 1898. This is the house that he lived in the rest of his life. The house was in Green Lake, Washington at the time it was built. Green Lake is now part of Seattle and the house is still standing on Wallingford Avenue North. My mother was born in the Green Lake house in 1900. Being the youngest child by quite a few years, and for many years the only child at home, she frequently listened to family history and experiences being retold. As a child she worked with my grandfather in his shop where she became acquainted with his cabinet-making business. Mother lived with my grandparents until she was married in 1924 to my father, Douglas D. Duncan. When my grandfather became quite ill in the 1930’s, my parents moved back to the family home to help care for my grandparents in their later years. My grandfather died in 1938 and my grandmother in 1943. I believe during these years much of the family history was again shared. As a result, my mother became quite interested in family history and became the Anderson family historian . My grandparents had three children older than my mother who Mother mentions in her comments. Hannah (b. Dec. 1884) and Esther (b. Apr. 1887) were my mother’s sisters...the ones who produced the power for the saw in Port Townsend. Her brother was Oscar (Carl Oscar b. Aug. 1889). Each sibling was given an instrument made by my grandfather, one which may have been a mandolin. However, over the years several of these have been given away or at least are no longer in family custody. Fortunately, my cousin Lois’s son, Gary Wright, (Otto’s great-grandson) has two guitars which were passed down when his mother passed away. We will be getting more information and pictures of these in the new year. As to family, we have records of all of Otto’s children, grandchildren, great-grandchildren, and great-great grandchildren. Many of these still live in the Seattle area and we are together for family events. I was born in 1939, my parents’ only living child. I came home to live in the family home built by my grandfather, and lived there for the most part until I was married to John Detlor in 1969. My parents continued to live in the family home. My father died in 1981. Mother stayed in the home until she became ill and had to go to a nursing home where she died in 1994. We still own the family home...it is a rental at the moment, but both our children, Bill and Susan, are interested in living there some day and carrying out the family tradition. Someday the guitar and violin will be passed on to our children...and hopefully some day to their children! We are so excited to have finally learned more about our wonderful family heirlooms...the harp guitar and the violin. My only regret is that my grandfather and my mother are not here to tell us more. They would be so pleased to know what a great treasure they passed on to us. 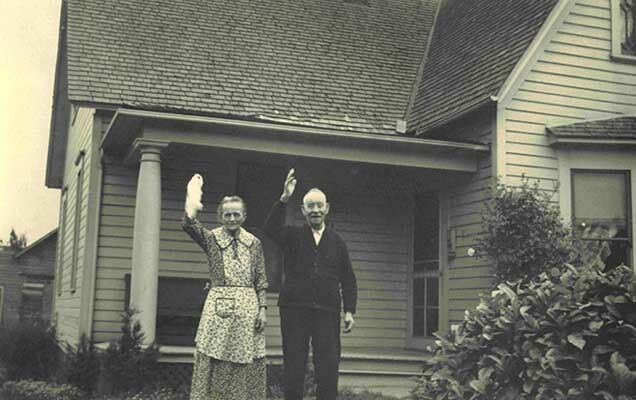 This is a photo of Otto and Elise in front of their house in Seattle. 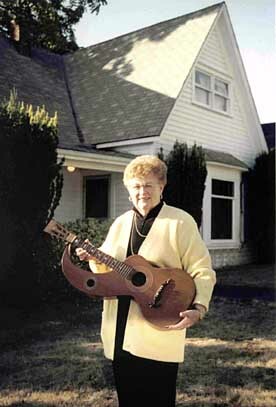 The author holding her Anderson / Knutsen guitar. And this photo was taken seventy years later in front of the same house - Otto's home after 1898. It is also the house that I lived in when I was growing up.